Quite a number of novel effects can be obtained by the aid of one or more mirrors. If two mirrors are take and placed parallel to one another, and a person placed between, the effect obtained is as shown in Fig. 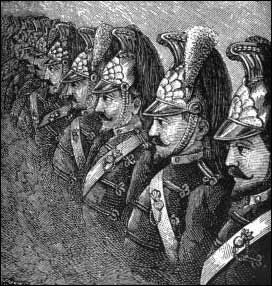 I, where one soldier appears as a whole regiment drawn up into line. To make this experiment we require two large-sized mirrors, and they must be so arranged that they do not reflect the camera and the photographer, but give only multiple images of the sitter. This will be found quite possible; all that is necessary is to make a few preliminary experiments, adjusting the mirrors at different angles until the desired effect is obtained. 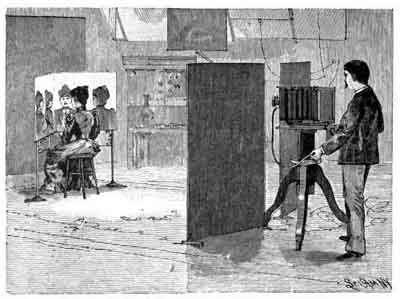 A process of multiphotography which was at one time quite popular consisted in posing the sitter with his back to the camera as shown in Figs. 2 and 3. In front of him are arranged two mirrors, set at the desired angle to each other, their inner edges touching. In the illustrations here given the mirrors are inclined at an angle of 75 deg., and five reflected images are produced. When an exposure is made and the negative developed, we not only have the back view of the sitter but the full reflected images in profile and three quarter positions as well. In the diagram, Fig. 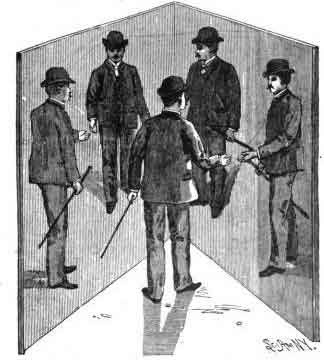 2, reproduced from “The Scientific American” the course taken by the rays of light, determined by the law that the angle of incidence is equal to the angle of reflection, is plainly marked out. We see here their passage from the sitter to the mirror and back to the camera. Provided the mirror be large enough, images of the full length figure can be made as shown in Fig. 4. For photographing articles where it is of advantage to secure a number of different views of the same object this method of photographing with mirrors opens up quite a wide field of possibilities. In France it is used for photographing criminals, and thus obtaining a number of different portraits with one exposure. The use of an ordinary mirror in portrait work has enabled photographers to produce very pleasing results. There is often a very striking difference between the full and side views of a person’s face, and by means of such a combination as this, one is enabled to secure a perfect representation of both at the same time. In making reflection portraits it has often been noted that the reflection has a more pleasing effect than the direct portrait. The reason of this is that it is softer and the facial blemishes are not so distinctly brought out. There is naturally a slight loss of detail, but this is by no means a drawback. The worst fault of the camera in portrait photography is the tendency to include every detail which the artist would suppress. It not only includes all the detail, but often exaggerates it to a painful extent. By making a portrait by reflection this defect is avoided. Of course the image is reversed, but this is in most cases of little consequence; in fact, the sitter himself would be more likely to consider it a far more truthful likeness, for when we look into a mirror we do not see ourselves as others see us, but a reversed image. With some faces the difference is quite striking. Woodbury, Walter E. Photographic Amusements. Boston: American Photographic Publishing Co., 1922.